The Surprise City Council approved a $275.8 million Fiscal Year 2018 Budget, at a Special Meeting Tuesday night. The budget maintains existing city services and identifies creative options to maximize some resources. That includes securing outside revenue sources and reallocating the operating budget to provide new positions that address public safety, water and inspection demands. Two public safety grants (SAFER Grant and COPS Hiring Program) will partially fund a five-member Fire-Medical Peak Time Response Unit and two police officers, focused on community policing, through 2019. This budget maintains the city’s current property tax rate of $0.7591 per $100 of assessed property valuation. Due to new construction and higher property valuations, as assessed by Maricopa County that would generate approximately $380,100 in new money. The primary property tax levy is set to support the uses of the General Fund and provides a more diversified revenue system that protects city services. The budget also dedicates $49.8 million to support the city’s Capital Improvement Plan (CIP), which is used to maintain, preserve, and/or replace city infrastructure. This includes funding for pavement preservation of city streets, vehicle replacement and aging communications, information technology, recreation and utility infrastructure. There are also a number of financial policy revisions regarding the level at which Council adopts the budget, who can amend the budget, minimum fund balances for the new Stormwater and Workers’ Compensation funds, and clearer definition of the reserves and their potential uses in the General Fund to strengthen the city’s financial position. Council will vote to set the property tax levy and revise the financial policies at their June 20 Council Meeting. 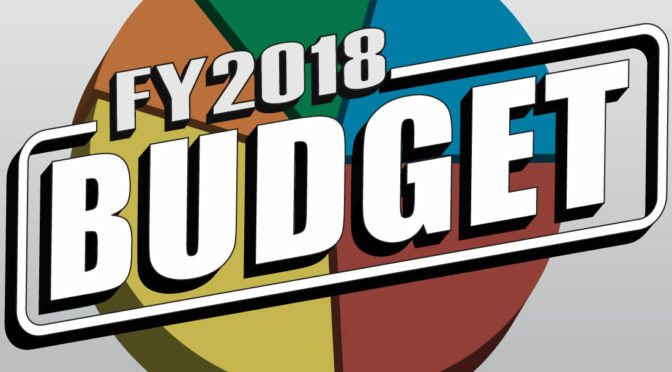 The FY18 Budget will be available at www.surpriseaz.gov/budget. This year is certainly passing quickly. There are so many exciting things happening in Surprise! I’m grateful to be part of it. We are rapidly approaching the end of our (FY) 2018 budget discussion. At the City Council meeting on May 2, City Council adopted the tentative budget for the upcoming fiscal year (FY) 2018 in the amount of $336.9 million. This includes $276.2 million of expenses and $60.7 million of transfers between different funds within the City. This represents an increase of $0.4 million from the City Manager’s recommended budget presented on April 18. Operating expenses account for $162 million or 48% of the total budget. This includes a Peak Time Response Unit to strengthen Fire response times and two community policing officers, both programs partially funded by grants. A third ambulance will be brought into service funded through transport revenues. Capital Improvement expenses total $49.7 million, a large portion of which is dedicated to maintaining or replacing infrastructure and equipment. The FY2018 tentative budget also includes $56.6 million in contingency that is set aside for future planned or potentially unforeseen purposes. In addition to the budgeted amounts, the City will have $37.2 million held in reserve. The budget is balanced, meaning that the sources of funds is greater than or equal to the uses of funds for FY2018. This is the first step in adopting the fiscal year budget and sets the maximum expenditure limit for the upcoming fiscal year that starts on July 1. The Council will look to finalize the process by adopting the final budget on June 6 and the property tax levy on June 20. City staff briefed City Council on three proposed General Obligation Bond questions in the areas of Public Safety, Traffic Congestion Mitigation and Pavement Preservation, at the May 16th Work Session. The three proposed questions and projects, as presented to Council, were determined based on community needs, comments received from residents during the 2016 bond election outreach process, and input received during and after the Surprise Capital Improvement Funding Exploratory Committee’s April 19 meeting. Proposed Question #1: Voters in Surprise are asked to consider a $34 million public safety bond proposal to: build a Public Safety Evidence & Readiness Center; renovate an existing city facility into a Police Training Facility; acquire Land for Future Fire Station/Police Substation & Park; build a new Fire Station at Cactus and Litchfield roads; build a new Fire Station along 163rd Avenue, south of Happy Valley Road, to replace the current temporary station; and build a Public Works Operations Facility to centralize operations. The annual cost for a homeowner would be approximately $26 per $100,000 in Limited Property Value (LPV). Proposed Question #2: Voters in Surprise are asked to consider a $15.5 million street bond proposal to provide funds to plan, design, construct and improve Waddell, Greenway and Litchfield roads. The annual cost for a homeowner would be approximately $12 per $100,000 in Limited Property Value (LPV). Proposed Question #3: Voters in Surprise are asked to consider a $10 million street pavement preservation bond proposal to plan, design, construct, replace and improve deteriorated street pavement citywide. The annual cost for a homeowner would be approximately $8 per $100,000 in Limited Property Value (LPV). Per City Council consensus at the Work Session, staff will bring back a Call to Election action item at the June 6 Regular Council Meeting. If approved, the three separate bond questions would appear on the ballot in a Special Election on November 7. All registered voters in Surprise will receive a ballot by mail. City Council Work Sessions begin at 4 p.m. and Regular Meetings begin at 6 p.m. They are open to the public and carried live on Surprise TV and online www.surpriseaz.gov/surprise11. All meeting agendas are posted online at least 24 hours ahead of the meeting at www.surpriseaz.gov. Surprise is most definitely growing and District 3 can personally attest to it. We’ve recently approved the annexation of Magnolia Farms which was formerly Maricopa County land and many new developments are moving along. Zanjero Trails located on the northwest corner of Peoria Avenue and Perryville Road is under construction with parcels 12A, 12B and 13A. The current home builders are Gehan, Beazer, and Meritage Homes. Currently, the developer is proposing a preliminary plat for parcel 16 & 17, consisting of 103 single family homes and is scheduled to go before Planning and Zoning on May 2. Magnolia Development will be moving forward with rezoning and preliminary plat for 175th Avenue and Sweetwater Avenue, for approximately 55 single family homes. The development is located west of Cotton Lane between Waddell Road and Cactus Road just south of the Sweetwater alignment. The remaining parcels should follow shortly after that but at this time, we do not have a timeline. Acoma Court located between Custer Lane and Acoma Drive west of 157th Lane is under construction. The home builder is Garrett Walker Homes. Prasada Development at the Walmart Center is proposing an 8,300 square foot Multi-Tenant Retail Building, currently under site plan review. Toll Brother’s Proposed Development is a masterplan concept on 765 acres with a modified 18-hole championship golf course surrounded by residential homes. Sierra Montana Crossing – The developer has submitted a site plan for an 8,000 square foot multi-tenant retail shop building that will be facing Cotton Lane. The retail shop building can accommodate a mixture of future retail tenants, such as a drive-thru coffee shop or fast food or a restaurant with an outdoor patio. 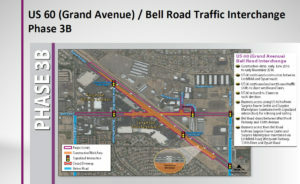 Greenway Crossing is located on the northwest corner of Greenway Road and Loop 303. The developer is proposing a project to divide the existing single lot into four separate parcels with a new Plat. It is proposed that the three new parcels on the front (south) part of the lot will be developed with a mix of retail and restaurants with drive-thru facilities. The site plan request was heard by the Planning and Zoning Commission on May 18 with the final plat to be heard by City Council on June 6. I recently returned from the National League of Cities (NLC) Congressional Conference in Washington, D.C. This annual conference brings more than 1,000 elected and appointed city leaders together to discuss local, state and federal policy issues, establish and further develop relationships with our Congress and discuss best practices with similar municipalities throughout the country. The current administration has considered more than $6 billion in cuts at the US Department of Housing & Urban Development this upcoming budget cycle. The plan would tighten public housing support and terminate most federally funded community development grants which provide services such as meal assistance and clean-up of housing in low-income neighborhoods. The proposed EPA reductions that could cut back more than two dozen programs that allow city leaders to protect resources, prepare for natural disasters and promote healthy/strong communities. The reductions also include a 20 percent downsizing of the EPA’s 15,000 workforce and a 25 percent reduction of its $8.1 billion budget. The plan would require congressional approval. FEMA cuts that reduce potential disaster relief funding. Community Oriented Policing Services (COPS) Program could be eliminated. The pros and cons to repeal and replace the Affordable Care Act (ACA) were discussed. Advocacy for a non-partisan health care plan, either maintaining ACA or providing a replacement that will enhance the strengths of the ACA, without impacting health care coverage to our residents and ensuring that the cost of repeal is not shifted to local municipalities were part of the discussion. Concerns were shared regarding mental health coverage, as well as treatment for drug addiction, specifically opiod addiction. Current proposal from the White House eliminates Medicaid. Cities need to be proactive as to who will resume those services. 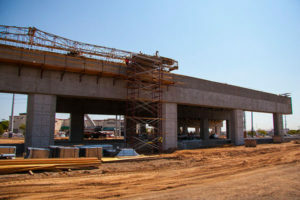 NLC encouraged local municipalities to focus on public safety, infrastructure, and the economy and to continue discussions with local officials to focus on supporting infrastructure projects that produce jobs, specifically in transportation, water, and fiber. Surprise is a college town! Earlier this year, Ottawa University announced that they are transitioning into a 4-year residential college in Surprise with classes beginning this fall. Ottawa will offer a full complement of academic, athletic and student activity programs including multiple undergraduate and graduate degree programs. Furthermore, the university will be home to 21 varsity men’s and women’s sports teams including baseball, basketball, golf, and soon football. The university is a member of the National Christian College Athletic Association and will be working toward a National Association of Intercollegiate Athletics (NAIA) designation. Upon award of the designation, OUAZ would be one of only four NAIA programs in Arizona. The school mascot is a grey wolf and the sports teams are called the Spirit. 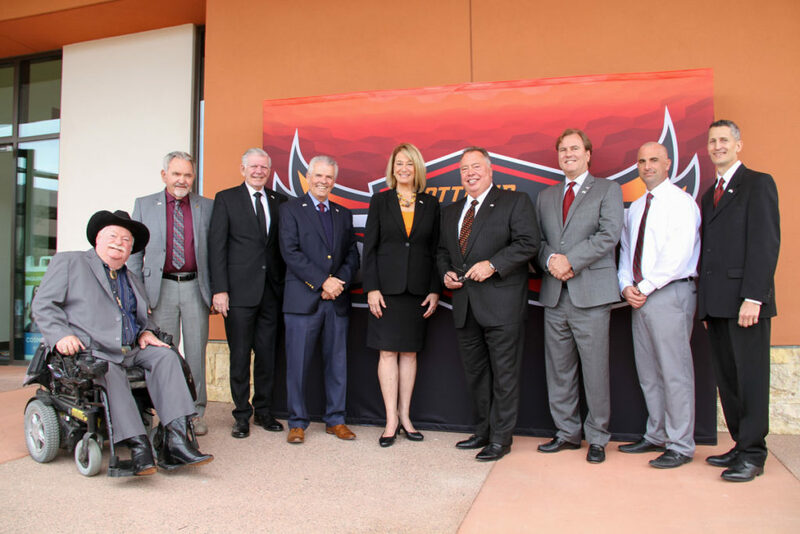 Ottawa University President Kevin C. Eichner announced the university aims to enroll 250 students for its first semester of classes at the new campus, with a target of up to 3,000 residential students over 10 years, adding to its current 8,300 alumni roll in the Arizona market. The future 35-acre OUAZ campus will be embedded within the Surprise City Center, integrating with the existing 250-acre City of Surprise Civic Center and Recreation campus. The school will also launch out of existing space within the Civic Center. Expansion plans for the campus include the development of residential housing, an indoor activity center, dining and conference space, and new athletic fields, including a stadium with artificial turf for football and soccer. Our Economic Development Department continues to work hard to bring more business to Surprise. While District 3 has seen the opening of Subaru Superstore of Surprise, Panda Express and Goodwill this last quarter, more will be coming. Most recently, Planning and Zoning approved a conditional use permit/site plan for a Sonic drive in restaurant. Over the last three months, we’ve seen the openings of Firehouse Subs, Dairy Queen, Arizona Federal Credit Union, and Luv 2 Play. Thanks to our engaged city, we were able to collect data that helped identify the city’s retail strengths as well as opportunities to bring additional amenities closer to home. Some of our desired restaurants include In-N-Out Burger, Portillo’s, Sweet Tomatoes, Pita Jungle and El Pollo Loco. Some of our top ten desired retailers include Costco, Hobby Lobby, Whole Foods and Home Goods. Residents also voted for their local favorites which included Jim’s Burgers and Eggs, Babbo’s Italian Eatery, Rio Mirage, and Saigon Kitchen. Local favorite retailers included Kimbur’s Pet Wash, Kohl’s, Musical Surprise, Target, Son Glow Boutique and Walmart. Over the last six months, I have been meeting with executives from Leadership West to develop a West Valley youth leadership initiative. 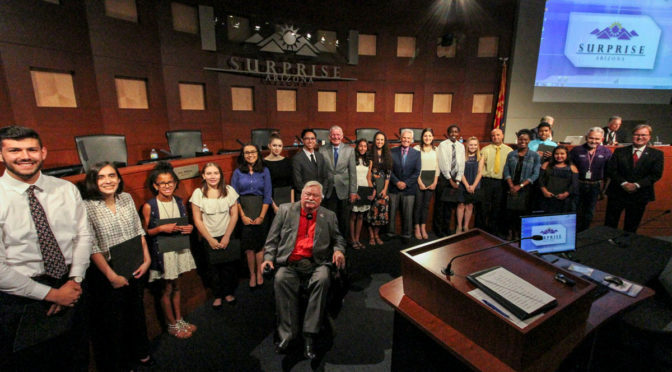 The program would involve high school students from Surprise and our surrounding cities and provide them with opportunities to partner and collaborate with their peers, elected officials and other leaders in the West Valley. Empowering youth to serve as advocates to local issues, fostering pride in community service and emphasizing the value of civic engagement are some of our goals we will accomplish. I recently hosted a passionate discussion with other elected officials that was very successful. We hope to begin the program this fall! For more information, please contact me. On the night of Saturday February 25, you may have seen an array of multi-colored lights in the sky and heard the sound of laughter and dance music cascading down from the 4th floor of the Civic Center parking garage. This was Level 4; the first annual social event planned and executed by the Surprise Youth Council, featuring music, dancing, a host of games like air hockey and old school arcade favorites, live art, food, and much more. From 6 to 9 p.m., more than 220 teenagers from high schools all around Surprise came to dance, eat, and socialize with friends in a positive and unique environment unlike any other in the City. Part dance club, part rooftop party, Level 4 provided teens with the experience of an exciting big city event here in their hometown. 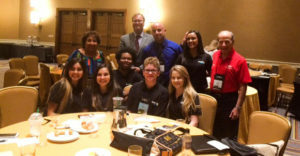 The City of Surprise’s Youth Services Division is committed to developing Level 4 into one the City’s signature youth events, growing our youth’s sense of connection to their community and the City’s reputation as an innovative and forward thinking organization which is truly invested in the quality of life of our youth. Stay tuned for more exciting events, programs, and initiatives coming out of Surprise’s Youth Services Division. The Surprise Youth Council has been busy delivering valuable programs and services to our local high school students. Over the course of three weeks in March, four SYC members put on a 7-part BLOOM 365 workshop series dedicated to promoting healthy relationships and combating teen dating violence at Paradise Honors High School. The response to this training series has been overwhelmingly positive, with students engaging one another in important conversations around consent, abuse, and healthy boundaries. Many of the students who attended the trainings have shared that the information they received changed their perspective on what it means to be in a healthy relationship and said it has encouraged them to stand up for themselves and others. The SYC is currently in negotiations with the Dysart Unified School District (DUSD) and plans to run the BLOOM 365 workshop in DUSD schools this fall. The SYC is dedicated to supporting the academic success of local students and has worked hard to provide our community with opportunities for developing academic skills. Most recently, SYC members organized and helped facilitate a free SAT preparation course at one of our local Surprise libraries. The course was taught by an experienced SAT tutor and allowed more than 25 students to learn best practice strategies for taking the test, as well as ask questions pertaining to their personal academic needs. One of the SYC’s other recent priorities has been to ensure that the Council’s makeup accurately represents the makeup of our community as a whole. The months of February and March are the Council’s recruitment period and SYC members explored new strategies for recruitment which would ensure that they were able to reach a wide range of candidates whose diversity in background, experience, and skills would deepen the impact made by the Council. They utilized social media, school counselors, local affinity groups, and passed out flyers in underrepresented neighborhoods in order to achieve these goals. These efforts were largely successful. SYC membership has now significantly increased. With new members come new ideas and new opportunities to do meaningful work for the youth in our community. The Surprise Youth Council is excited for bright days ahead. New SYC Members were sworn in at the City Council meeting on May 2. Earlier this spring, Ottawa University Arizona head baseball coach Tim Montez announced his first signing class that consisted of four players from Surprise! Please join me in congratulating Outfielder and Pitcher Dylan Chelini from Valley Vista, Catcher Eric Ramos and Outfielder and Pitcher Lester Acoba from Willow Canyon High School, and Outfielder and Pitcher Adam Bronston from Shadow Ridge High School! 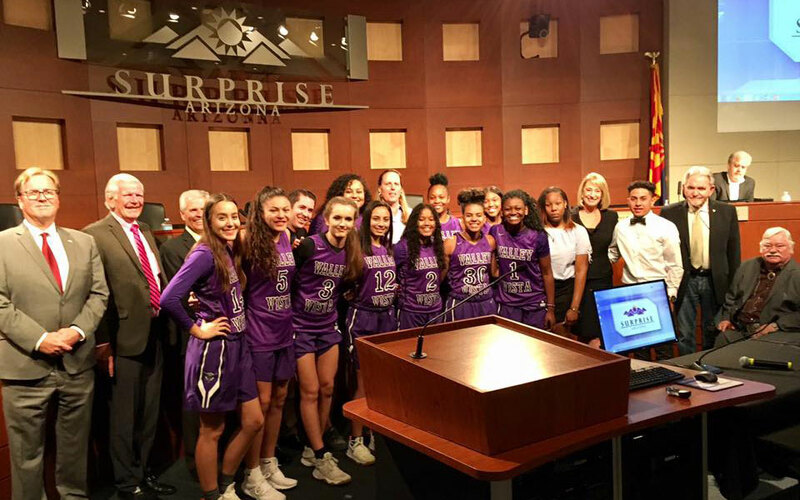 City Council recognized the Valley Vista High School Girls 6A State Champion Basketball team at a March meeting. The team is led by coach Rachel Matakas who was named 6A Coach of the Year! Teammates told us that they won because they worked hard on building a true team, one that was committed to each other and understanding of each other both on and off the court. Congratulations to the team on a 26-6 winning year and a state title! Summer Youth Basketball League: Recreational leagues for boys and girls ages 5-15, and competitive leagues for 14U & 17U boys and girls. The summer basketball season will start in early June and run until the end of July. Games are played on Saturdays and/or weeknights. Practice times are up to the volunteer coach, but are usually once a week at 5:30 pm, 6:30 pm or 7:30 pm for one hour. Age is determined on or before July 31, 2017. Summer Break Sports Camps: Surprise is also offering a number of Summer Youth Sports Camps in June and July, including basketball, football, baseball, softball, volleyball and soccer. Flag football and soccer registration starts in July. For a list of camp dates and details, please visit www.surpriseaz.gov/2017/Sports-Camps-and-Clinics or call 623.222.2000. With summer around the corner, I wanted to share a summary of recreation events as well. May 30 – Recreation Swim & Dive Team practices begin at Surprise Aquatic Center and Summer Swim Lessons begin at Surprise Aquatic Center and Hollyhock Pool. Drop in Recreation is available at Sierra Montana. Open Gym is available at Countryside and Villanueva Gym from 5 pm until 9 pm Monday-Friday, and 12 pm-5 pm on Saturday. Of course there are a variety of special interest classes and tennis classes to choose from this summer. For more information on these events, programs or classes, please visit www.surpriseaz.gov/recreation. Please mark your calendars for my next community meeting – May 24 at 6 pm! The meeting will be held in the Community Room of City Hall. Everyone is welcome to attend. This is our time together to talk about what interests, ideas or concerns you have for our city. You can RSVP to Jodi Tas at Jodi.tas@surpriseaz.gov. City Manager Bob Wingenroth presented a $336.5 million Fiscal Year (FY) 2018 Recommended Budget to City Council at Tuesday’s Work Session. The Recommended Budget maintains existing city services and identifies creative options to maximize some resources. The Recommended Budget also includes $49.8 million to support the Capital Improvement Plan (CIP), which is used to maintain, preserve, and/or replace city infrastructure. This includes funding for pavement preservation of city streets, vehicle replacement and aging communications, information technology, recreation and utility infrastructure. There are also two recommended financial policy revisions regarding the Minimum Fund Balance Policy for the General fund and the Stormwater and Workers’ Compensation funds that will provide clearer definition for the reserves to strengthen the city’s financial position. The FY18 Recommended Budget will be available at www.surpriseaz.gov/budget. Council is scheduled to vote on the final budget in June. The City of Surprise Fiscal Year 2018 budget-building process begins at the City Council’s Work Session, 4 p.m., Tuesday, February 7. This is the first in a series of presentations regarding the overall development of the budget. This presentation will give a general overview of the city’s budget and review the calendar for the upcoming process. Emphasis will be placed on the areas of policy making that the City Council has available to impact the FY2018 budget. The presentation will also discuss outside issues that will influence the outcomes of the budget process. Future Council Work Sessions and Regular Meetings will include additional presentations related to budget development, including topics on Capital Improvement Projects and continued operating budget discussions. This process will result in the adoption of a balanced FY2018 budget in June. FY2018 begins July 1, 2017. Council agendas are posted online at http://agenda.surpriseaz.gov/ at least two business days before the meeting. City Council meets the first and third Tuesdays of each month. Work Sessions are at 4 p.m. and Regular Meetings begin at 6 p.m. All meetings are carried live on Surprise TV for cable customers and streamed online at www.surpriseaz.gov/surpriseTV. As September rolls in, I hope everyone is enjoying the final days of summer. School recently began and fall is rapidly approaching! It’s hard to believe we have completed two months of fiscal year 2017. I am hosting a District 3 Update meeting on September 13 at Surprise Honda, located at 13270 N Autoshow Ave. I appreciate my constituents and thank you for sharing your thoughts and ideas on future development! I share your passion for growth and I would love to see many of the amenities discussed. Please join me on the 13th from 5 pm until 6 pm as we will receive an Economic Development update from City staff, a Prasada update, and bond information. A tour of the new dealership has also been offered by Surprise Honda General Manager Leon Lee. After meeting with constituents and members from our schools over the last year, I am happy to report the completion of Cactus Road from 175th Avenue to Cotton Lane is complete! 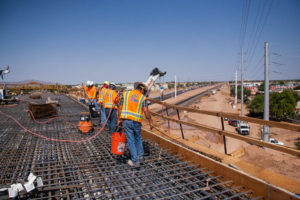 This pavement project provides additional east/west connection, in addition to Waddell Road, for the neighboring communities of Sara Ann Ranch and Sierra Montana as well as Shadow Ridge and Paradise High Schools. Construction on the Bell Road bridge project continues and Bell Road is on schedule to open as originally planned in November 2016. 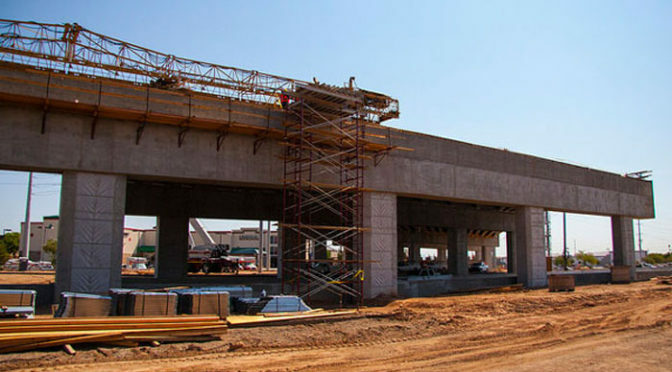 Current work includes the building of the retaining wall panels of the bridge over Grand Avenue and the reconstruction of the eastbound Grand Avenue roadway. Grand avenue traffic is temporarily sharing westbound lanes while the old asphalt pavement on the east side has been removed and the utility relocation occurs. This budget also dedicates $53 million for capital improvements to preserve and/or replace aging infrastructure, such as increasing funding for the Pavement Preservation Program to $4.5 million. Investments in communications, facility, information technology, recreation and utility infrastructure amount to $6.8 million. And $10.5 million will support replacing aging vehicles to enhance service and lower maintenance costs. Beginning in November, the city will assume responsibility for billing the water, waste water and sanitation utilities. By removing these operations from a third-party vendor, the city will be able to provide more efficient operations and provide an improved customer experience. This service will result in an additional 11 positions. The ongoing utility billing budget of $1.7 million that had been paid to the third-party vendor will remain the same once the city transitions to the billing responsibilities. The FY17 Budget also provides funding to add Sunday Dial-A-Ride service and continue Saturday and holiday pick-ups. Great things are happening in Surprise and that includes several new businesses that have recently opened or are opening soon. 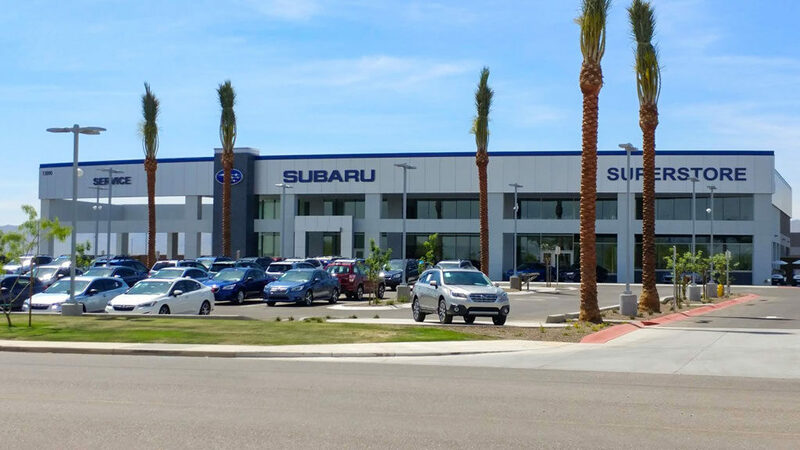 Surprise Honda opened its doors last month in the Prasada Automall and Hyundai and Subaru dealerships are under construction now. Burger King opened a few months ago in the Walmart Plaza on Greenway, west of Loop 303. Other businesses scheduled to open include the new Babbo Italian Eatery, Oregano’s Pizza Bistro, Dickey’s Barbeque, Ono Hawaiian BBQ, Firehouse Subs and a few more. By now, you’ve probably noticed some important enhancements to the ShopSurprise digital marketing campaign! With more than 2,000 ShopSurprise subscribers and nearly 123,000 messages and deals announced, you are doing your part to support our Bell-Grand area businesses during the Bell Road bridge construction! The Surprise Regional Chamber of Commerce text message service provider, Dex media, recently scheduled a service upgrade to keep this successful campaign up and running, with a new feature- coupons sent directly to your email, no more having to click a link. That required a new text opt-in number, which is 85100. Follow @ShopSurpriseAZ on Twitter to have deals tweeted to you daily. A Construction Business Access Map is also available online to help you find the best ways to enter the shopping, dining and service centers to claim your deals. 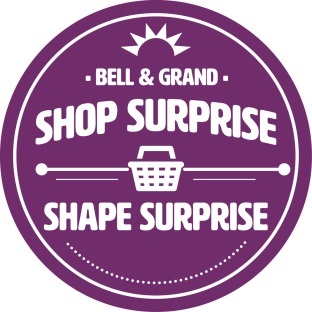 The Bell & Grand ShopSurprise daily deals are only available during the Bell Road full closure. The Chamber will consider a more comprehensive, citywide campaign in the future. General Obligation Bonds are sold to investors who are repaid with interest. The repayment comes from a secondary property tax, which Surprise does not currently have. If approved, the secondary property tax could be up to $0.50 per $100 of limited property value, which on a home with an assessed value of $200,000 would be a yearly maximum increase of $100, or $8.33 per month. Additional educational public meetings will be scheduled ahead of the November 8 General Election. Meeting dates and locations will be posted at www.surpriseaz.gov/surpriseforward. You may also visit the website for a complete list of projects, renderings, financial impact information and public survey results. The Surprise City Council approved funding to support the Neighborhood Grant Program that provides eligible neighborhoods with small grants to fund neighborhood events, functions or even some community improvements. Interested communities should deliver the complete Neighborhood Grant Program application to City Hall, attention Jodi Tas, by 5:00 p.m. on Friday, October 5. For more information about the grant, visit Neighborhood Grant Program or contact Jodi Tas, 623.222.1330. Registration for City of Surprise Fall Youth Sports, including girls’ volleyball, Babe Ruth softball and Cal Ripken tee-ball and baseball, began this week. Registration will be offered through September 24, with a special Saturday registration on September 24 from 8 – 11 a.m. at the Community and Recreation Services office, located at 15960 N. Bullard Ave. Office hours are Monday – Friday, 8 a.m. – 5 p.m. Registration will also be available online at www.surpriseaz.gov/recreation. While emphasis will remain on basic fundamentals, sportsmanship and cooperative participation, this program differs from recreational sports in that there are NO MANDATORY PLAYING TIME RULES. The competitive sports league will follow modified NFHS rules and is intended for EXPERIENCED PLAYERS ONLY. Participants will go through a skills evaluation on Friday October 14, 2016 and will be drafted onto a team. Special requests will not be honored in competitive programs. Any player that is not selected in the draft is guaranteed a spot in the recreational volleyball league. All teams will compete in an end of season, single elimination tournament. The City of Surprise invites you to volunteer for the upcoming fall sports season as well! The Community and Recreation Services department is dedicated to providing our volunteers the information and confidence they need to have a fun and successful season. If you are interested, please complete a volunteer application at the Community and Recreation Services Office. For more information, please contact the Sports Division at 623-222-2000 or visit www.surpriseaz.gov/recreation. America’s Mighty Warriors (AMW) will host the 2nd Annual Marc Lee Fitness Challenge in Surprise at Surprise Community Park on Saturday, November 5. The fitness challenge will include a 5K run/walk which will begin at 7 a.m. and the fitness challenge portion will begin at 8 a.m. For more information, please visit www.americasmightywarriors.org/fitness-challenge/. The City’s 2nd Annual Veterans Day Parade is scheduled for Friday, November 11. This parade will travel along Bullard Avenue in front of Surprise Stadium. This year, the event will kick-off with a pancake breakfast and Veteran art show prior to the parade start at 9:30 am. I hope to see you there! The City is currently looking for patriotic-themed parade entries for the parade. We are seeking clubs, organizations, groups or residents who would like to participate. There is no fee for participation. Interested parties may obtain an entry form online at www.surpriseaz.gov/specialevents or at the Community & Recreation Services offices at 15960 N. Bullard Avenue. 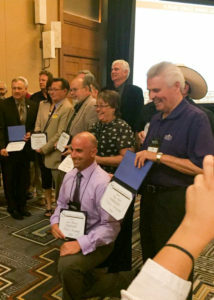 The Arizona League of Cities & Towns Conference began on Tuesday, August 23. This conference is a great opportunity to reconnect with other Council Members throughout the state, network with agencies who work with Surprise and help build the momentum the City Council has been able to achieve. Part of this year’s conference included meetings with Cox Communications regarding digital contour and EPCOR regarding their plans to combine their water districts. In addition, I was able to attend several sessions including the impact of military bases in Arizona, education initiatives and much more. City Council attended a focus group discussion on why our youth leave the State; Surprise was represented by our very own Surprise Youth Council (SYC) Member Samantha Salazar. Following the youth session, members of SYC competed in the Democraseed Challenge and placed third. The Center for the Future of Arizona and Arizona State University’s Office of Entrepreneurship partnered with the Challenge to foster creative civic engagement projects. Congratulations to our SYC team! Councilman Skip Hall and I received service awards during the Legislative and Service Award Luncheon on Thursday, August 25. Congratulations to Skip on his years of service. I have enjoyed serving with you! Luke Air Force Base Celebrates 75 Years! Luke Air Force Base is the largest fighter-training base in the entire world, with thousands of military personnel working diligently to protect us. Luke AFB is one of the largest employers in Arizona with approximately 6,000 employees. It is estimated that the families and personnel of the Base contribute an overall impact of over $2.15 billion to our economy. We are very fortunate to have this asset, not just in our State, but in the West Valley. As a resident and as an elected official, I am grateful! Happy anniversary to Luke Air Force Base! I will be taping another Council Conversation regarding an upcoming education initiative. Keep your eyes on Surprise TV for more information! In closing, it has been an honor to serve you the last four years. I am grateful, honored and humble to serve you for another term.